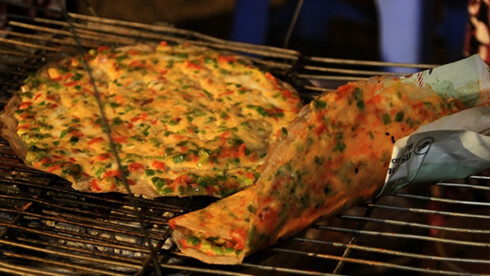 ‘Banh trang nuong’ (Grilled rice paper with egg), dubbed as Vietnamese pizza, is one of the most popular street snacks for students and teenagers in Vietnam. It is not very difficult to make the delicious dish. Spreading all toppings over the rice paper and grill over char coal until the butter and cheese melted. Toppings include dried small shrimps, quail eggs or chicken eggs, spring onion, fried pork, and sausage. When grilling, use spoon to spread well all ingredients around the face of rice paper. Continue grilling until quail egg is cooked. Whirl rice paper gently to make sure it cooks well. Finally, folding in half and eating with chili and tamarind sauce or cutting it into medium pieces for serving.